SOMERSET-based duo The Dry­stones are on a UK spring tour, making seven stops in the south and west, from 13th April until 17th May. Fiddler and vocalist Alex Garden and Ford Collier, who sings, plays guitar and tin whistle, have been playing together since secondary school, and released their first album in the same year as completing their music degrees. 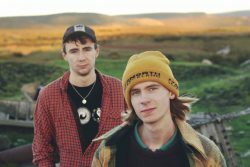 After eight years playing together, they were nominated for the 2018 BBC Radio 2 Young Folk Award. Their new album, Apparitions, is bold and adventurous with breath-taking instrumentals breaking boundaries but sounding strangely familiar. They will be introducing fans and new listeners to the Apparitions music, as well as playing older songs, at Sheepstor Village Hall near Yelverton on Saturday 13th April, at the Ritz Club in Burnham -on-Sea on 18th April, Ashcroft Arts Centre in Fareham on 25th and The Lights at Andover on 26th April, Bristol Folk Festival on 5th May and at Callington Village Hall on 17th May.